Some one million refugees have escaped the ongoing violence in South Sudan to find sanctuary in northern Uganda. A vast settlement has been established in just a matter of months to house many of them. The Bidibidi settlement is home to some 270,000 people - a figure comparable to the population of Malmo - and is one of the largest refugee hosting sites in the world. The majority of the population of Bidibidi are South Sudanese women and children who enjoy the same basic rights as all citizens of Uganda. Yet the residents of this sprawling settlement - particularly its children - still struggle with the memories of the terrible events they have witnessed. Joshua is in school when the war reaches his city. There are explosions and all the children are sent home. Joshua comes home to find an abandoned house. His mother left her family before the war broke out for another man. But he does not know where his father and sisters are. He is worried. Together with a group of boys he flees the city. For a week they walk through the woods and swamps. When they reach a house they hear voices and hide in the bushes. A mother is breastfeeding her baby. She is surrounded by rebels and begs them to - at the very least - spare the life of her child. There is nothing Joshua and the others can do. They continue their journey to Uganda. When they reach the river that marks the border they see it is full of corpses. Joshua knows his aunt is in Uganda too and with nothing more than her phone number, he and the Ugandan police try to trace her. They succeed - his aunt and sisters have safely reached Uganda and Joshua is reunited with them in the Bidibidi settlement. "I have to think a lot about what has happened. Apart from going to school, I don´t like it here. I miss my stuff. Here I only have two pairs of clothes and some school books. But at home in South Sudan we had 28 goats. And I miss my father. His name is John. At night I dream about him. I dream we are playing together." Where are her parents? Winnie doesn’t know. Her mother remarried and left the family; Winnie has not seen her father in years. Together with her grandmother, uncle and aunt, she has been living in Bidibidi settlement for some six months. "When the rebels came, they locked up people in their homes and put them on fire. My house also burned down,” Winnie recalls. “I was terribly afraid. We left everything and started running." In Bidibidi she is safe. "I'm glad I don’t hear gunshots anymore and that I don’t see dead bodies." But in the settlement she still doesn’t feel at home. Many of the other children belong to other tribes who speak other languages. She does not understand them and often feels lonely. "I miss my best friend Wala; we watched movies together and danced in the village square. Here I live in a tent where I sleep on the ground. It's very uncomfortable." Winnie is also worried about her family members who stayed behind in South Sudan. “I don’t know if they are alive. Often I have nightmares and wake up in the middle of the night. Then I cannot sleep anymore." Vincent and his older brother John are orphans. Their father passed away in 2013; their mother was shot in front of them in the war. They sought refuge at an uncle’s house but weren’t safe there either. "Rebels attacked us,” remembers Vincent. “They shot at everything and everyone. Together with my brother I managed to get away. When we returned later, we found my aunt and nephews were murdered. Where my uncle is - and if he still lives - I don’t know." The brothers fled to Uganda. After days of walking a car stopped on the side of the road. They asked the driver for help but he refused. The 70 South Sudanese pounds they had on them is not enough to take the two of them. Only one of them is allowed to go to the border. "My brother said I had to get in, but I didn’t want to. I wanted us to stay together." The car continued on without them. The long journey caused Vincent's feet to be swollen and painful and John decided to carry his little brother on his back. They reached Bidibidi settlement in northern Uganda and were housed with a foster father. They are safe, but Vincent is still scared. He thinks about the war often and misses his home in South Sudan. "I miss the food we ate. At home we had a large garden with pineapples, chickens and lemons. Here we only eat beans. Sometimes there is not enough and we go to bed hungry." "Rebels went from door to door. I saw how people were shot, how they were killed with knives and machetes. My brother and stepfather were murdered. They called my brother and when he came outside they killed him," remembers Edward. “I was very scared. We started to run with just the clothes we were wearing." Edward now lives with his mother and little brother in Bidibidi settlement in northern Uganda. Sometimes he is angry about what happened. Sometimes he feels he wants to take revenge. Often he has nightmares. "Our village was a peaceful village. We heard about the ongoing war but thought it would stay far away. We thought it would not reach our village." In the settlement Edward made two new friends "They are my neighbours Daniel and John. 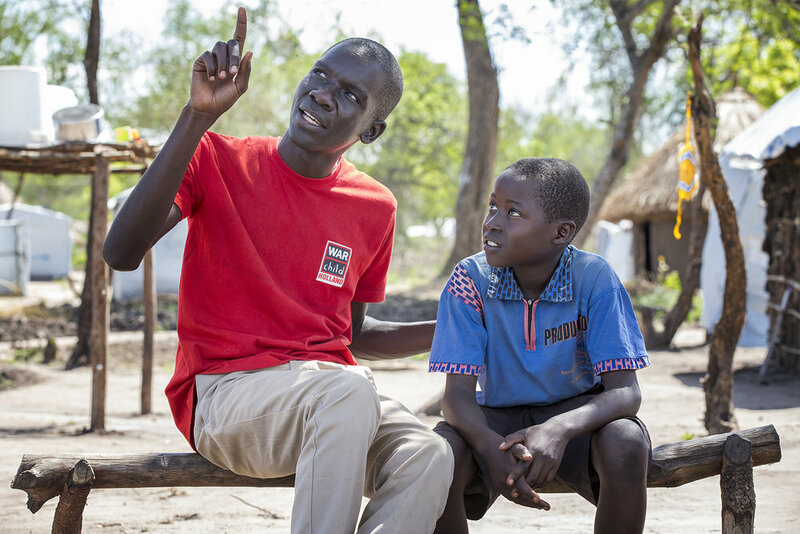 Because of all that has happened in South Sudan, I do not want to make too many new friends." Sarah does not talk. She whispers. She is quiet and withdrawn and has barely smiled for months. Her two parents died at the end of 2013 during South Sudan´s first outbreak of violence. In 2016, Sarah fled the violence with her older sister and brother-in-law. "Rebels came to our house,” she recalls. “They beat people, shot them and stabbed them. My aunt, uncle and the neighbours, they're all dead." Her uncle's front door was barred and his house burned with him still in it. In Bidibidi settlement she tries to pick up where she left off. But thinking of South Sudan makes her sad. She misses her school, her belongings and her friends. In the settlement she doesn’t have many friends. The other children do not speak her tribal language and her English vocabulary is limited. Yet she has one best friend, Alysa, with whom she likes to jump rope. Why Alysa is her best friend? "She does not like fighting," Sarah answers. Emma tries not to think about what she experienced in South Sudan. "It would affect my school performance too much," she says with a determination. Barely showing any emotion, Emma speaks about her last weeks in South Sudan before reaching safety in Uganda with her aunt and cousin. She recalls how the group of women she escaped with were shot at. And how some of these women belonged to another tribe and were raped and then murdered in front of her. By rebels from her own tribe who singled her out for being with the ‘enemy’. "Fortunately we were left alone by them. But we came across new rebel groups time after time. We had to give them all our belongings, our money, our livestock. Those who had nothing to give anymore were beaten. With nothing we finally arrived in Uganda." Now she lives in the Bidibidi refugee settlement. "My aunt says that my parents will soon come here too. I miss them because they have always taken care of me. And I miss the brick house we lived in and the food we ate. There was always plenty of food and it was nice. Here we only eat beans."